An early build of the new OS, known as Android N, was released on Thursday for app developers to test. Google said it had released the beta software earlier than usual so that device manufacturers could get the finished version sooner. At the moment, fewer than 3% of Android phones run the latest OS, Marshmallow. Typically, Google discusses the next generation of its Android OS at its annual developer conference in the summer. But this year it has released a first draft earlier than expected. “By releasing the first preview and asking for your feedback now (in March! ), we’ll be able to act on that feedback while still being able to hand off the final N release to device makers this summer,” wrote Hiroshi Lockheimer, senior vice president of Android, in a blog post. On Monday, Google published statistics that showed an older version of Android, Lollipop, was still more widely used than the latest variant. About 36% of Android devices run Lollipop, with fewer than 3% running the newer Marshmallow. But a range of new smartphones running Marshmallow, from manufacturers such as Samsung and LG, are due to be released. 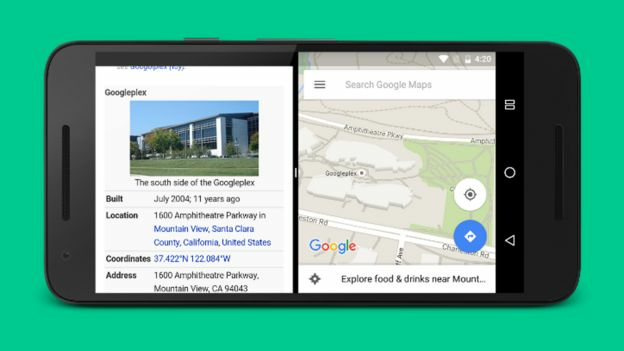 Android N will introduce split-screen multitasking that allows people to use two apps at the same time. Information can be copied across from one app to the other. A similar feature is already available on some iOS and Windows 10 devices, and Samsung has already added the feature to some of its Android smartphones. The new software also introduces some cosmetic changes to settings and notifications, and aims to improve battery life. Google has traditionally named new versions of the operating system after sweet treats, as was the case with Lollipop and Marshmallow. The newest version has not yet been named but it has been suggested that Android N will be named after a popular chocolate and hazelnut breakfast spread. “We’re nut tellin’ you yet,” said Mr Lockheimer, possibly hinting at the name.